Last week I asked: Where is the Three Gorges Dam? 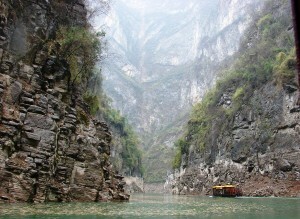 All that changed when the river was tamed upon the completion of the Three Gorges Dam in 2012. There was a lot of controversy surrounding the dam’s construction as I am sure there must have been similar concerns when the Hoover Dam was built. Thousands of people were displaced but the new towns created along the river looked very nice and there is no longer the danger of yearly flooding plus China needed the power to continue its rapid industrialization. Cruising the river between the gorges is still spectacular with the added experience of locking through the flight of five locks. John and I spent a couple days at the Crowne Plaza in Yichang before we boarded the Century Legend, the newest and most luxurious vessel on the Yangtze. Our plush room had a nice balcony – all the cabins did. There was a spa, swimming pool, a movie theater and other nice touches. All but two of the shore tours were included in the reasonable price. After breakfast the first day I went to the demonstration of Traditional Chinese Medicine. 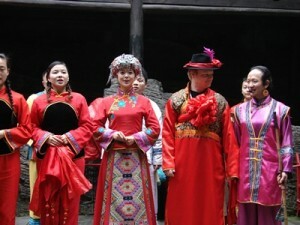 Then John and I took the tour of the Tribe of the Three Gorges, which turned out to be my favorite. It was one of the tours that incurred an extra charge but it was only $46 and well worth it. The Legend navigates through the massive locks. They refer to the area as Dream Land and I can see why. It was a misty day which brought to mind landscapes on Chinese silk paintings. The walk up one side of the gorge and down the other was broken up with wonderful sights: a beautiful young girl clad in red standing in a small traditional boat while a young man entranced her by playing the flute. There were girls washing clothes in the river, fishermen, monkeys scurrying about, scenic waterfalls and, as a grand finale, our group was “invited” to a traditional wedding with someone from the audience picked to portray the groom. The visitor center has a great display that explains the power project and to ascend to the top of the project there are several banks of escalators. We found that most of the tours in China include a lot of steps and walking. At the end of the first full day we joined the other guests at the Captain’s Welcome Party after which the crew entertained with an excellent cabaret show that included the famous Face Changing routine whereby the performer in traditional dress changes his face mask faster than the eye can perceive. It is really an amazing day and it wasn’t over. 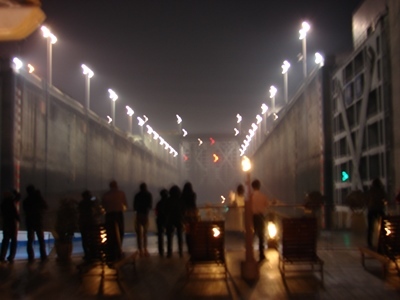 After the show it was time to go to the top deck and watch the Legend navigate through the massive locks. There are two massive sets of five locks to allow traffic to go both up and down stream simultaneously. 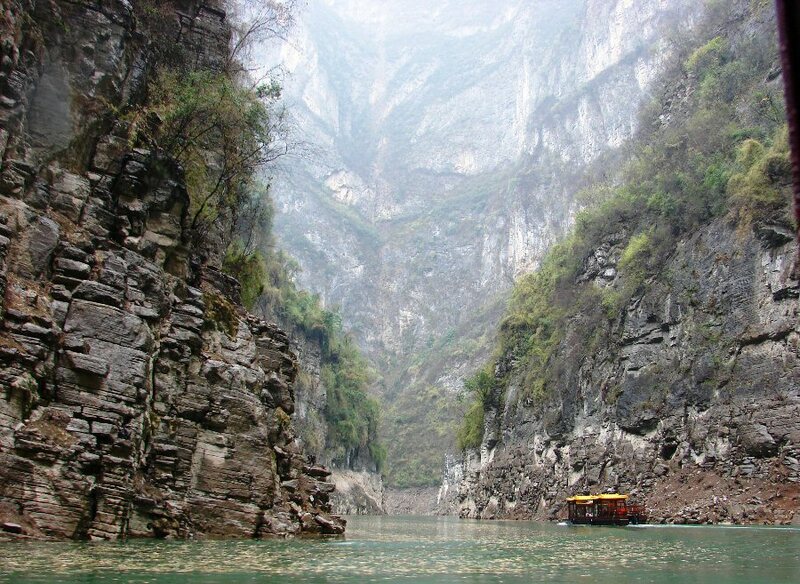 I also loved the tour to Goddess Stream on a beautiful traditional style boat that cruised between the narrow precipitous mountains. 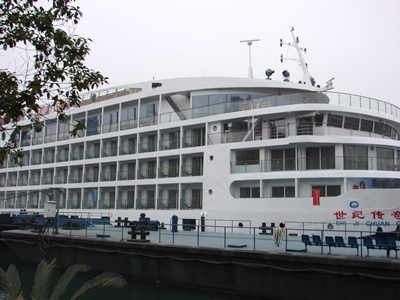 It was a wonderful five-day, four-night river cruise and the only thing I regret is not booking it round trip because I couldn’t do everything that was offered and still enjoy the luxurious accommodations. Trivia Tease™: Where can you visit a Flying Tiger’s Museum? Look for the answer next week.